Personalized Bamboo Serving Boards Just $12.99! Was $40! Shipped! You are here: Home / Great Deals / Personalized Bamboo Serving Boards Just $12.99! Was $40! Shipped! Until November 26 only! 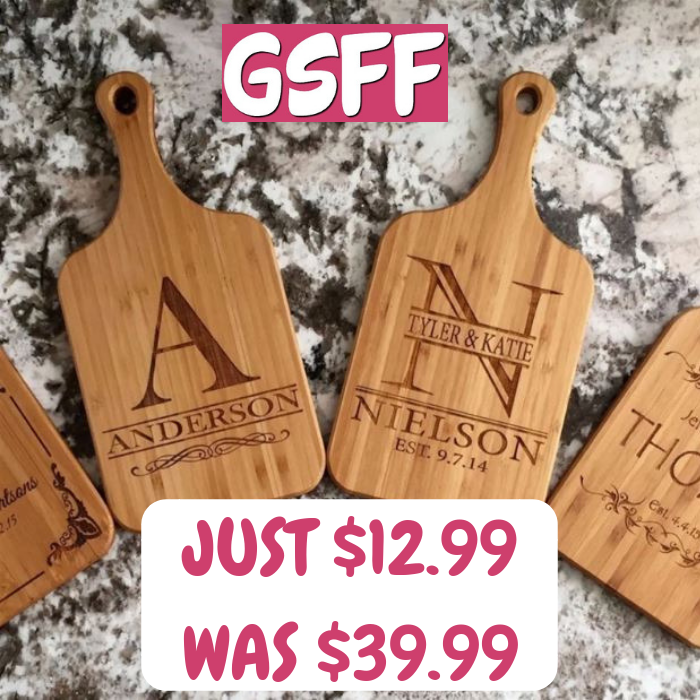 Jane is currently offering these Personalized Bamboo Serving Boards for only $12.99 down from $39.99 PLUS FREE shipping! These “Personalized Handled Bamboo Serving Boards” are absolutely stunning. These serving boards each have a hole drilled through the end of the handle perfect for hanging in any location! Choose from 8 beautiful designs! It will add the perfect balance of beauty and sophistication to your home, whether on display or in use! They are also perfect gifts for any time of the year! One side of the cutting board is personalized for display and the other side is used for food preparation. Bamboo is the best wood in the world for cutting boards. Each board measures 5″ x 11″.